First, a comment about the note concerning Journal #1 that was contained in Journal #2. Or, in other words…..The Rest of the Story! Just read your comments about difficulties with spelling. We owe that conundrum to one or two guys…Caxton and Pyson. These were two pioneer English printers. The first actually. Consider that in the 1400’s English as a language was still evolving and growing. These guys were mechanics working with the first printing presses and it fell to them to make crucial decisions about how a certain English word was to be spelled. Today we credit Caxton with bringing a degree uniformity and standardization to the spelling of English words. Further these decisions were entirely his. There was no equivalent to the Académie française, or Webster’s to consult. So in many cases he took his best guess and his choices have never been changed. It’s no wonder learning to speak and write English can be so maddening for foreign speakers. Back in the 1980’s PBS did a program called “The Story of English”. I received the companion book that accompanied the series as a gift and in discussing the difficulty of mastering English it describes no less than 13 ways we have of spelling the “sh” sound. (Shoe, sugar, issue, mansion, mission, nation, suspicion. ocean, conscious. chaperon, schist, fuchsia and pshaw). Kind of boggles your mind when you think about it. As you might expect, there’s a pretty good discussion about spelling reform in wiki. Thanks Randy…..so stick that in your Funk and Wagnall’s all you orthographist!!! 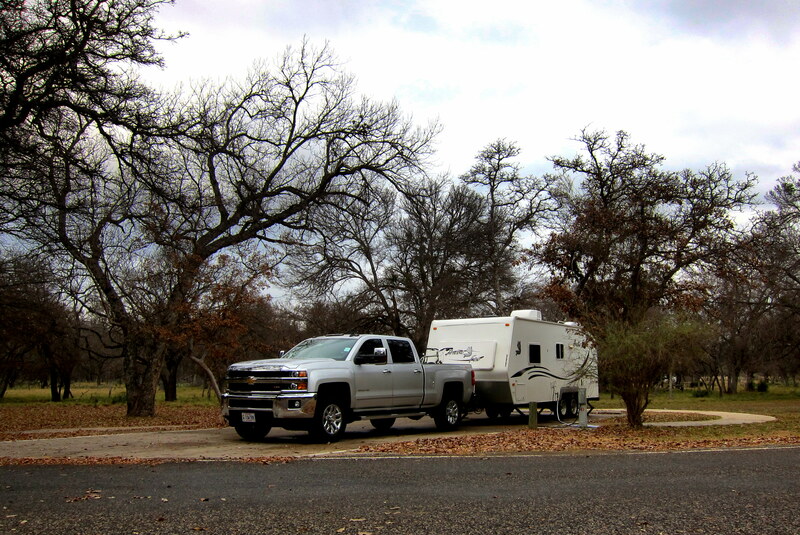 Thursday, December 11, 2014: Woke early camped in the beautiful South Llano River State Park to cool, drizzly skies interspersed with generally miserably wet weather. Kit and I had considered staying an additional night in order to more thoroughly investigate this interesting and picturesque park located just west of San Antonio, Texas. However considering the poor weather forecast, we decided to see what we could see, then motor on around mid-day. 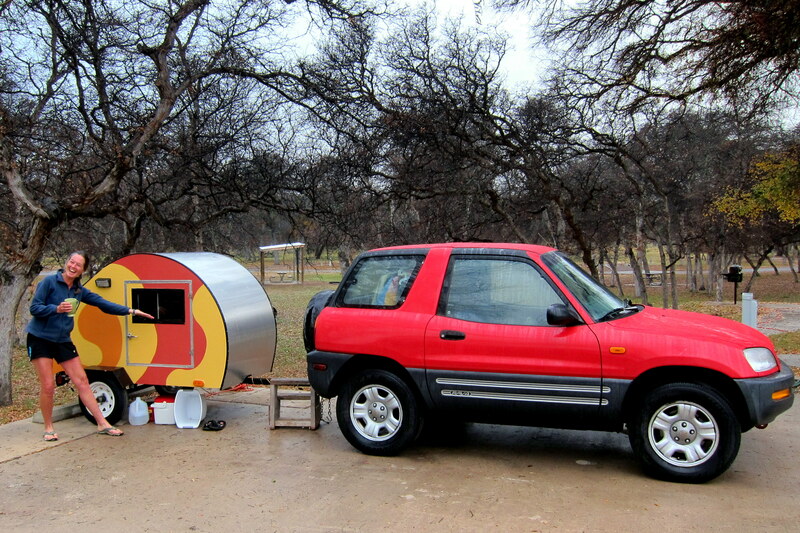 Out on my morning Scout and Patrol, I noticed a tiny teardrop trailer parked at one of the Camp Host sites. At first I thought it was just used for storage and possibly contained tools or equipment…..no one could possibly be staying in the thing! But I was proven wrong as the tiny door opened and this tall woman stepped out. Since it’s my belief that everyone has a story, I nonchalantly walked the camp road around to her site. As I passed, she let out a cheery “good morning” which was my cue to intrude on her morning. Laura is a retired professional woman traveling full time in the tiny trailer. In other words, she has no sticks and bricks home! As her story goes, a number of years ago she suffered a life changing event, quit her job, sold her house, and spent six months hiking the Appalachian Trail. After summiting Mount Katahdin in Maine, she hitched a ride back to her native North Carolina and stayed with friends. Not content to sit still, Laura bought a used Toyota Rav4, hooked it to that tiny RV (which was intended to be used as a motorcycle trailer) then hit the road…..that was over four years and 200,000 miles ago! Laura calls herself a minimalist and gets by on very few material possessions. She travels about the country and volunteering as a substitute park ranger or campground host…..basically pulling into an area, locating a nice wilderness campground and offering to spell the regular staff in consideration of a free camp site. An interesting lady, with a positive attitude and a zest for life……she is a real inspiration to those who think the only way one can full-time RV is with a mega-bus or monster trailer. While Kit enjoyed some morning quiet time, I set off to further explore this beautiful area by hiking one of the paths in the parks 18 mile multi-use trail network. Trekking along I discovered a noticeable diversity of terrain and vegetation. 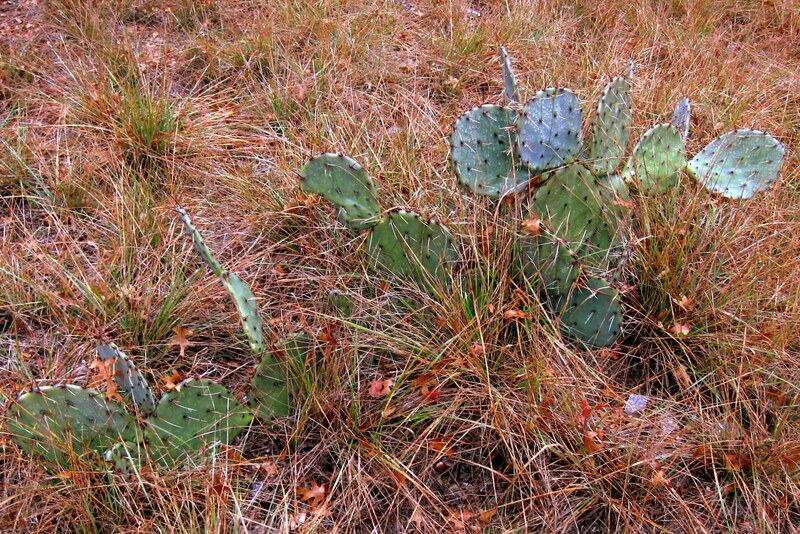 This area of the country nestled between the humid southeast and the semiarid southwest provides many examples where Mother Nature couldn’t decide if the environment was desert or prairie. 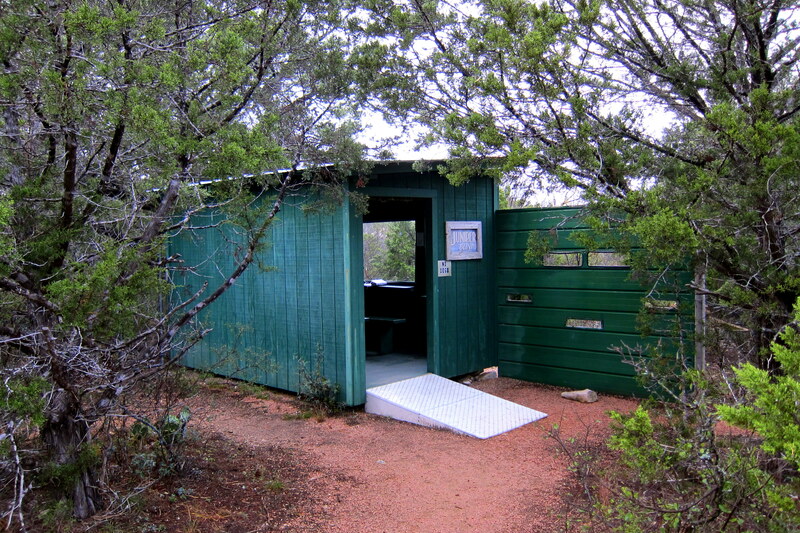 A bit farther up the trail I stumbled upon a “bird blind”, one of four such structures placed about the park for viewing and photographing wildlife. The shelter featured benches and chairs in a darkened room with windows and camera ports allowing undetected observation of the various manmade features built to attract wildlife. There is a solar powered pump that supplies fresh water to a natural looking pool and existing vegetation was utilized to provide animals with cover. 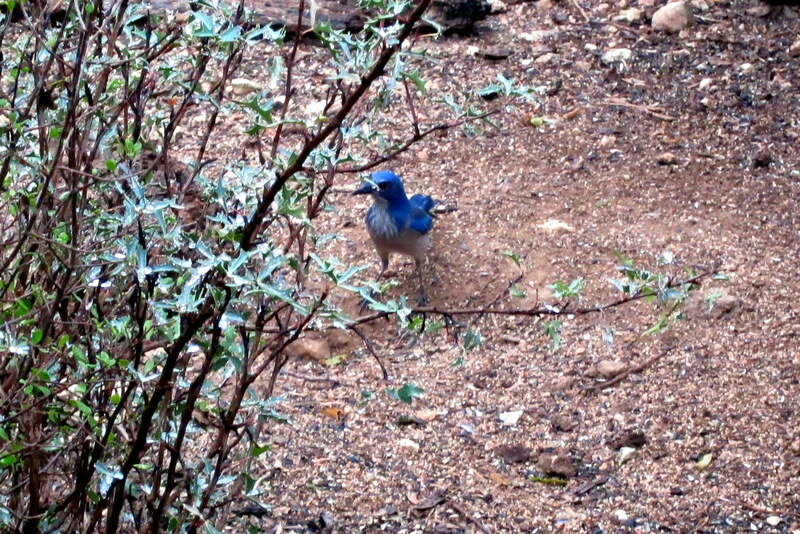 During my brief visit I noticed a number of native birds visiting the oasis, including this little fellow. And not to be outdone…..his brilliantly colored cousin. Pretty cool, huh. So to verify your powers of observation, did you also notice the grey Dove? How about the Deer? Or the Bunny? 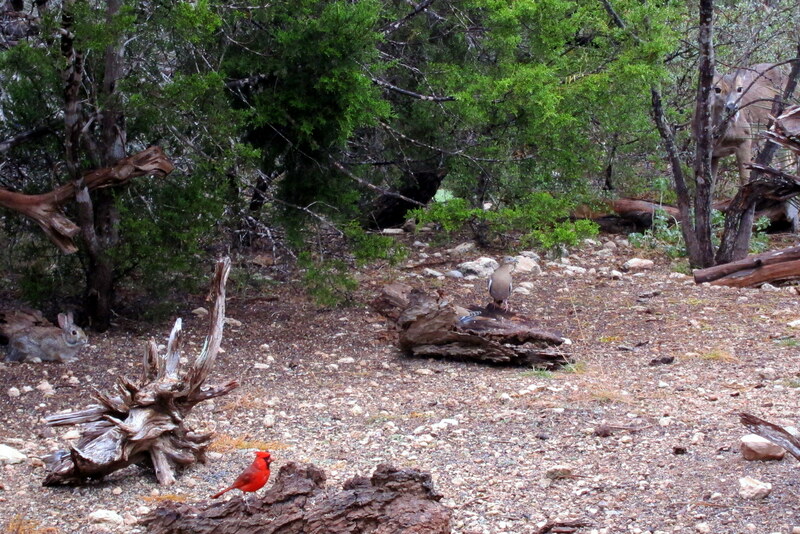 I find that photo a great example of wildlife’s ability to blend into the environment as a defense mechanism…..well; except for the poor Cardinal……I’ve nicknamed him “Lunch”! By 1030 Kit and I were back on the road heading west on I-10. 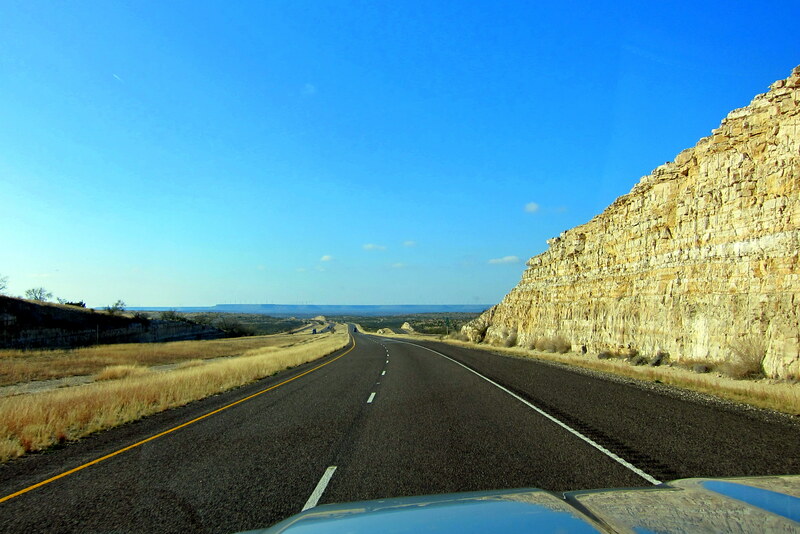 The sky began to clear as we put more distance between us and the easterly moving storm and by early afternoon, had transitioned from Hill Country to the flatter and drier Western Prairies. Later in the day, Kit and I stopped at a rest area for a lunch and some walking around time. Shortly after we arrived, an older Class B (van-based) motorhome, with a huge train locomotive air horn affixed to the roof, sidled up next to us. Immediately spotting a Moxie sticker in the window, and figuring there had to be a story there, I waited a considerate interval before approaching the rather interesting looking gentleman. When asked about the Moxie sticker, John calmly mentioned that it was in recognition of the fact that he was the owner of a Moxie Horse. Not familiar with the breed I inquisitively replied; huh? Seeing the quizzical expression on my face, a look that I sport often, he presented his business card. 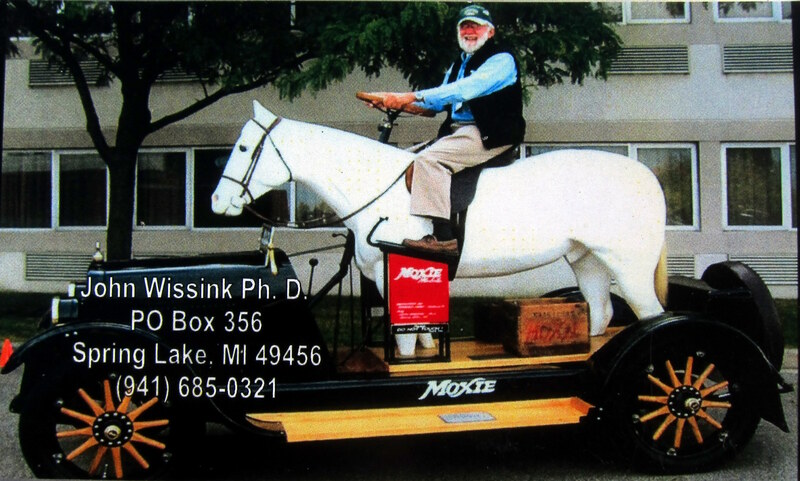 Yep, John does indeed own a Moxie Horse, and it’s mounted on a fully functioning automobile! He built the unique vehicle using a 1924 Buick and it’s a replica of the originals that were commissioned by the Moxie Beverage Company. Here’s a better shot of Johns car I grabbed off the internet. For those outside of New England, Moxie is a rather bitter soft drink tasting somewhat like cough syrup mixed with turpentine which was first bottled as a nerve tonic in the late 1800’s. 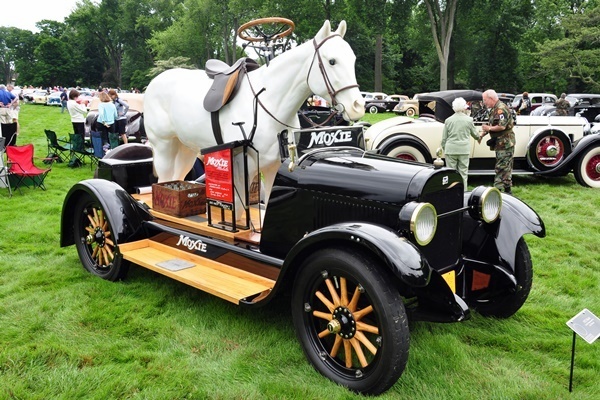 The first promotional Moxie Horse Car was built in 1916 and a number of others followed. The lone survivor, built on a 1929 LaSalle, is now on display at Clark’s Trading Post in Lincoln, New Hampshire where Kit and I viewed it some years back. Moxie is still being bottled by a subsidiary of Coca Cola and each year, in the second week of July, the history of this soft drink is celebrated at The Moxie Festival in Lisbon, Maine…..just 12 miles from our home. And John is indeed a Doctor of Philosophy……and a recently retired college professor. Oh, about those train whistles? That’s a whole other story! Back on the road following a relaxing and thoroughly interesting visit with John, we noticed that the clouds had cleared and the brilliant blue Texas sky once again appeared. 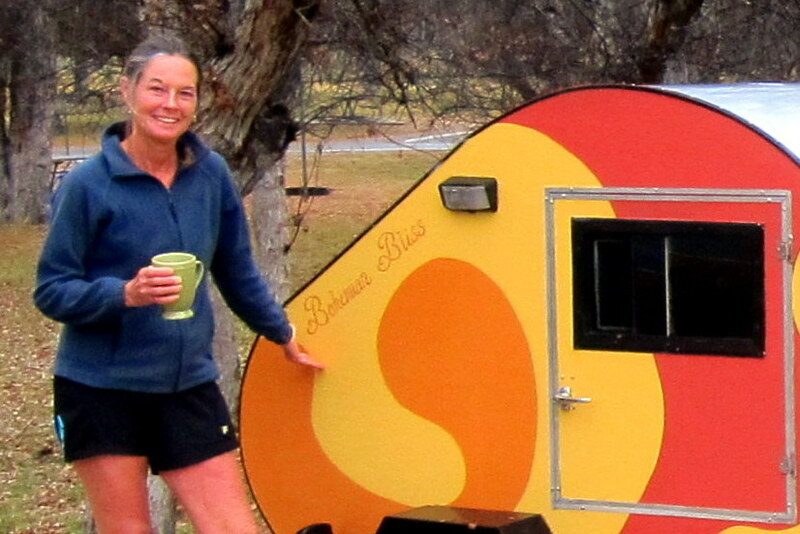 By late afternoon, we decided to pull into Balmorhea State Park for the evening…..a convenient location and a pleasant campground which Kit and I have enjoyed in the past. 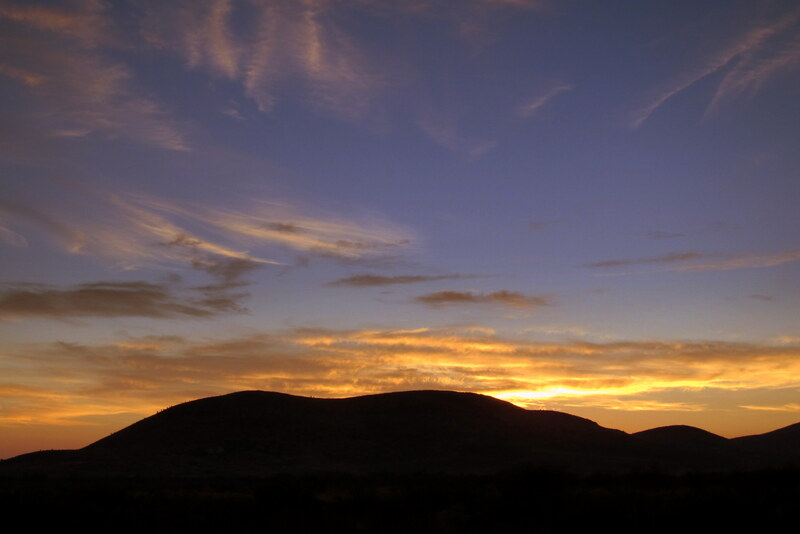 Being sparsely populated this time of the year, we were able to select an isolated site with a great view to the East. Where we sat in the waning daylight and enjoyed the sun setting over the hills to the west. This marked the end of another day of retirement bliss! 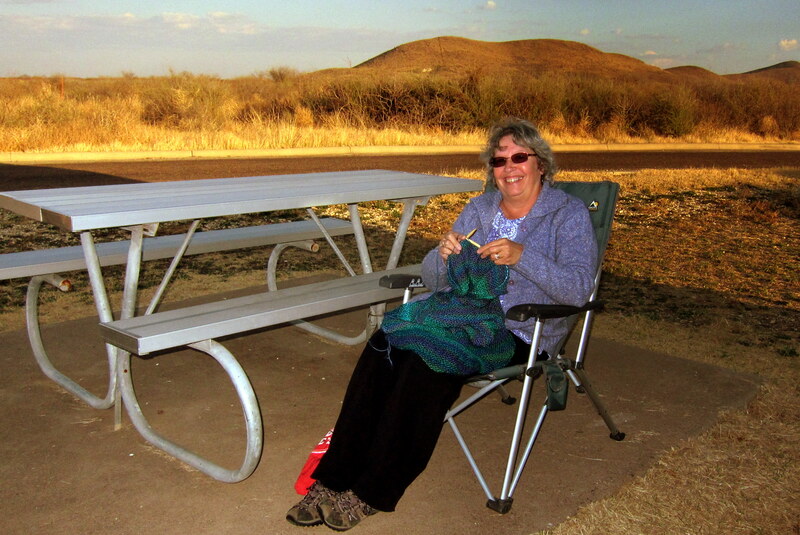 Friday, December 12, 2014-Balmorhea State Park, Texas: Kit and I decided to spend two nights in this park as we sorely (pun intended) needed a day out of the saddle and time to catch up on correspondence. The rainy weather was now far to the East and the brilliant sunshine caused the ambient air temperature to rise with a corresponding rise in our spirits! Balmorhea State Park was built around San Salomon Spring in the 1930’s by the CCC. It features the world’s largest spring fed swimming pool. The water is a constant 72 degrees due to the thermal effect of 15,000,000 gallons of clear spring water flowing through the pool each day. 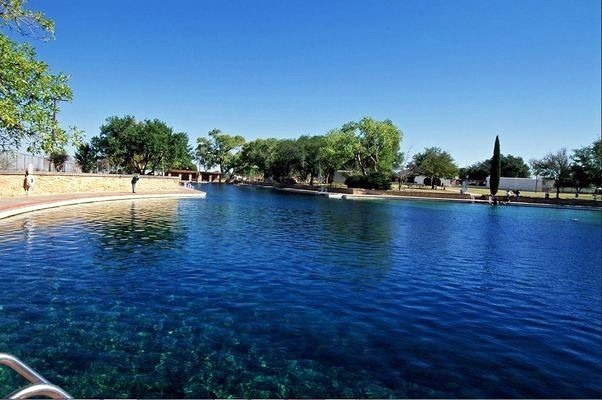 Balmorhea is used extensively for recreation, swimming lessons, SCUBA instruction and, yes…..fishing! Out on my morning walk about on this “down day”; I decided to “get down” with some hip Geocaching and I successfully located two of them. One of which was a first for me…..an Earthcache. This form of cache is usually placed at an unusual or historically significant location and marked only by its Latitude and Longitude, a physical cache does not actually exist. However in order to gain credit for the find, you have to e-mail the caches owner with photo proof you were actually there. Enjoyable find and simple to manage…..if I ever start placing geocaches, this is the type I would use. Nothing left to mar the environment and no maintenance involved! The Earthcache search took me down a short path to a Cienega, or wetland created by a spring, which pools and evaporates creating a Playa. 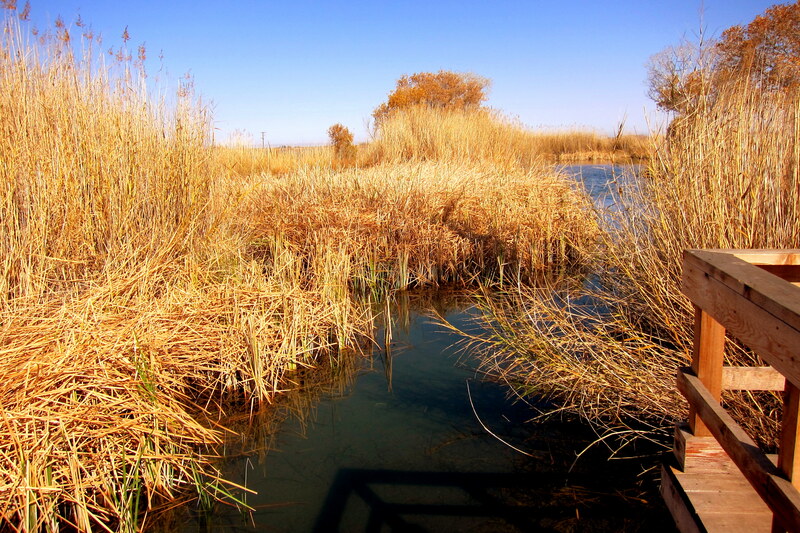 The water in a Cienega is alkaline due to the rapid evaporation which creates a natural habitat for unique desert birds and animals. So, how does one spot unique animals? Why, unique up on them of course! Sorry. 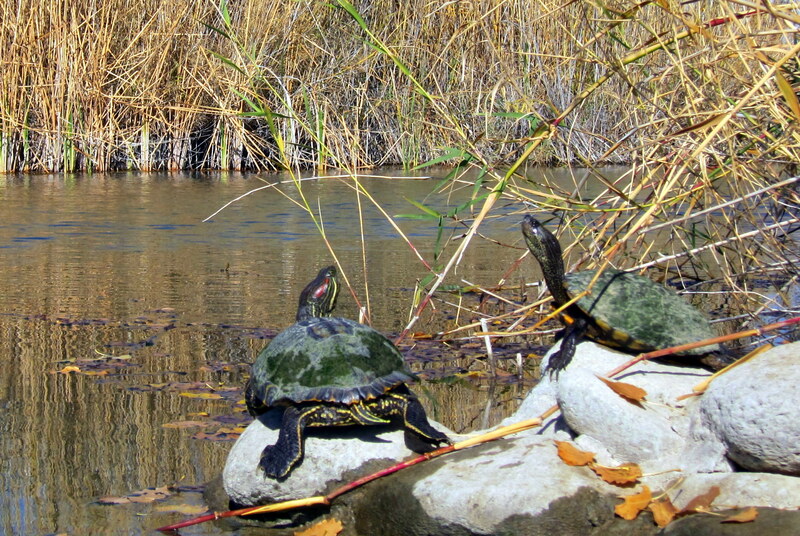 While waiting quietly for a few birds to find the only available water for miles around, I spied these two fellas sunbathing on a nearby rock. A short while later on the opposite side of the campground I spotted this peculiar bird running right down the middle of the road. 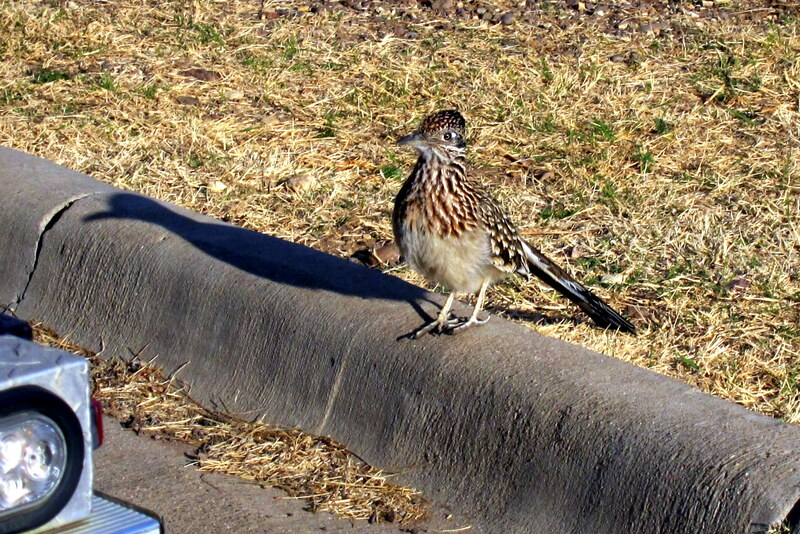 Peculiar conduct for an animal with wings…..and a very peculiar song, “Beep-beep”…..now what’s that all about? Being such a nice day, Kit decided to spend the afternoon in the shade of the camper and enjoy some knitting, one of her favorite pastimes…..well, other than trying to fix my faults that is. Following cocktail hour, a nice meal and stimulating conversation…..which I participated in by utilizing my powers of stimulating hearing, it was off to snooze-land. 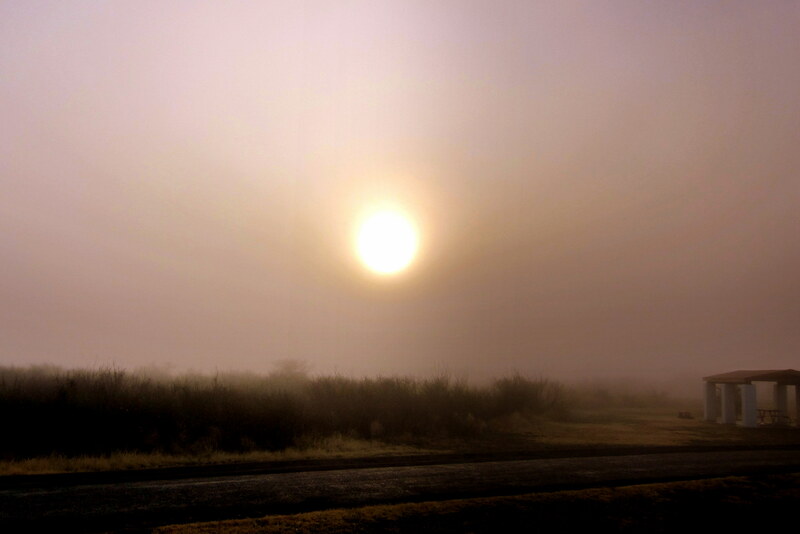 Saturday, December 13, 2014: Woke to a hazy sunrise across the meadow to the east. Following a hearty breakfast, Kit and I were once again off to the west under bright blue skies and pleasant temperatures. 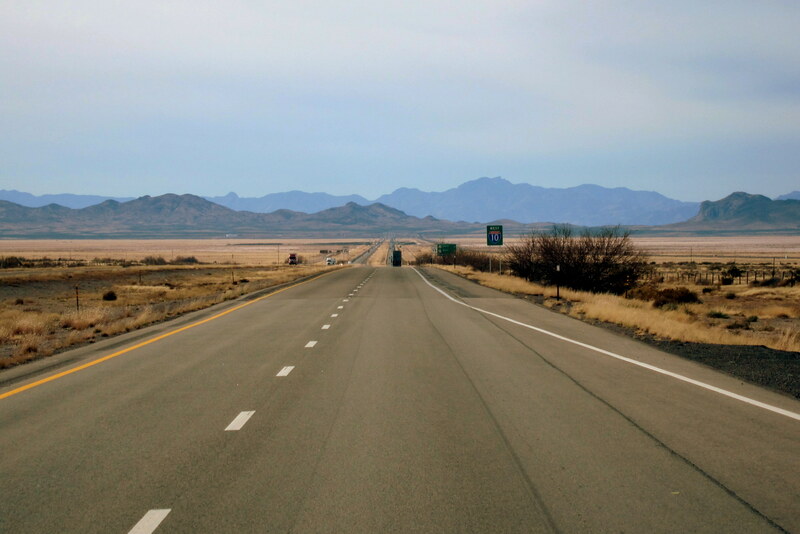 Not much to see in West Texas, just miles and miles of miles and miles! And what does exist, we have explored during past Excellent Adventure trips. However on the highway we occasionally come upon a few unique sights…..such as a whole string of trucks carrying these. 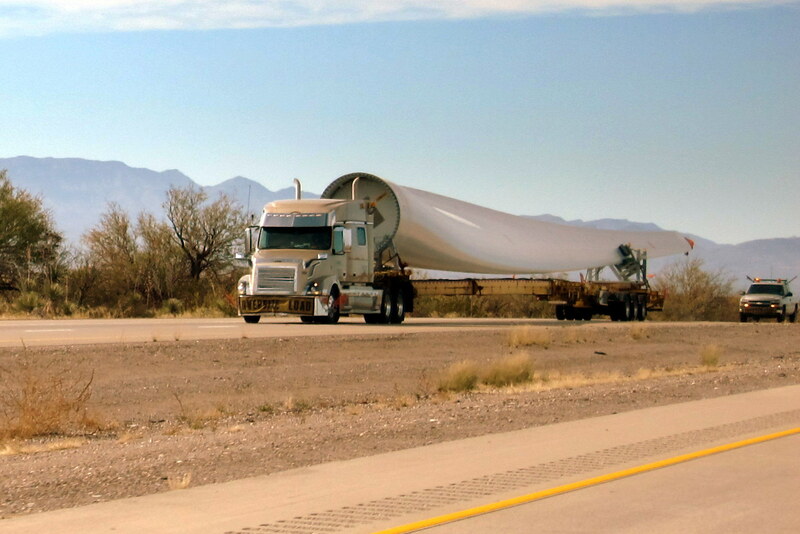 In case you may not know, that truck is carrying just one 116 foot blade destined for a wind turbine! The perspective of the photo does not adequately show the immensity of the thing! And to think the wind farms in this part of the country contain hundreds of turbines with three of those blades each!! 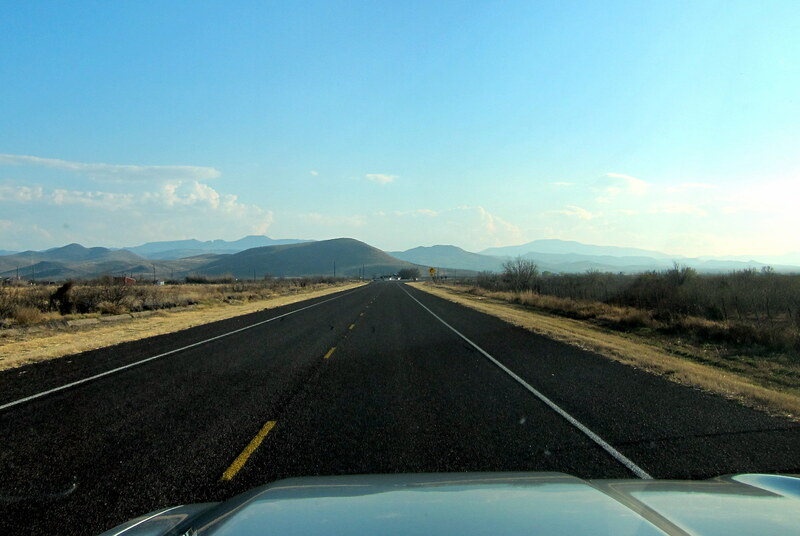 Approaching the western border of Texas the country of Mexico became visible. The community of Guadalupe, Chihuahua, Mexico can clearly be seen in the photo below. 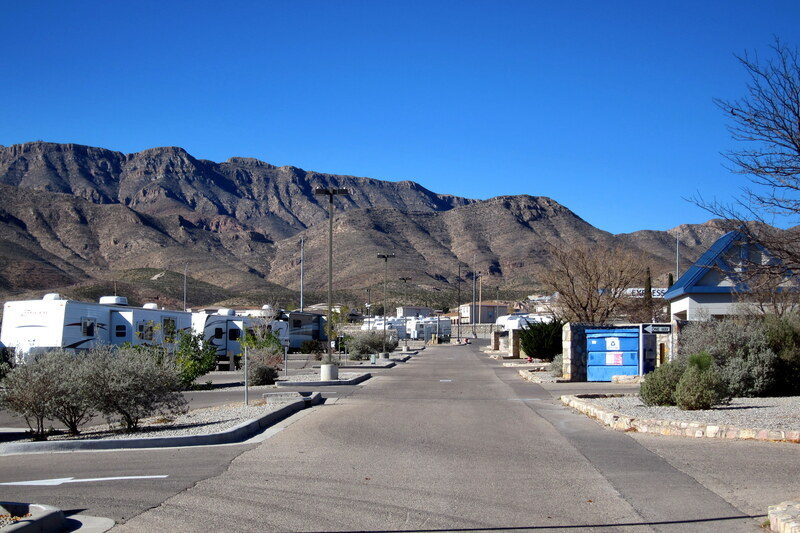 As Kit and I neared El Paso, which is Spanish for “pass quickly through this town”, we diverted to the north in a flanking maneuver and intersected the US Army outpost of Fort Bliss which would be our bivouac position for the next few days. 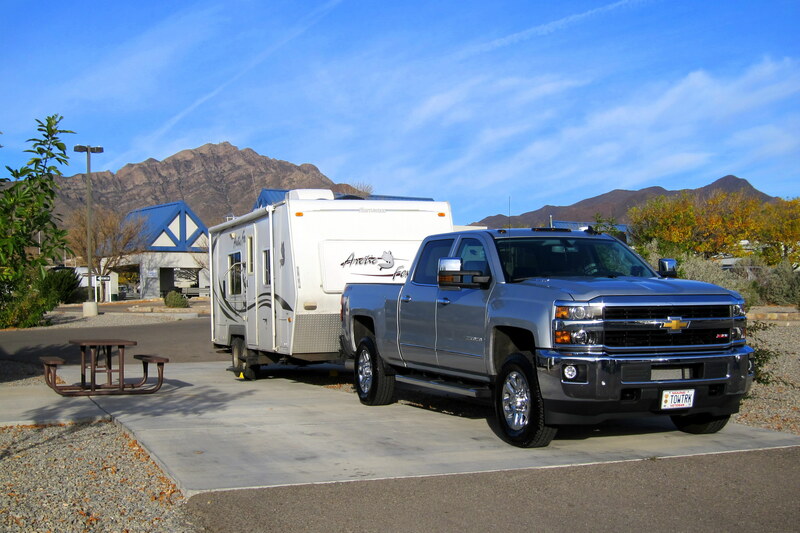 Sunday, December 14 and Monday, December 15, 2014-Fort Bliss, Texas: The RV Park affiliated with Fort Bliss is one of the nicest parks in the military complex. Too bad it’s close to El Paso and Juarez! Over the years we have tried to make peace with this very large Texas Cow Town but so far, have not accomplished it, and believe me we have really tried…..oh well. 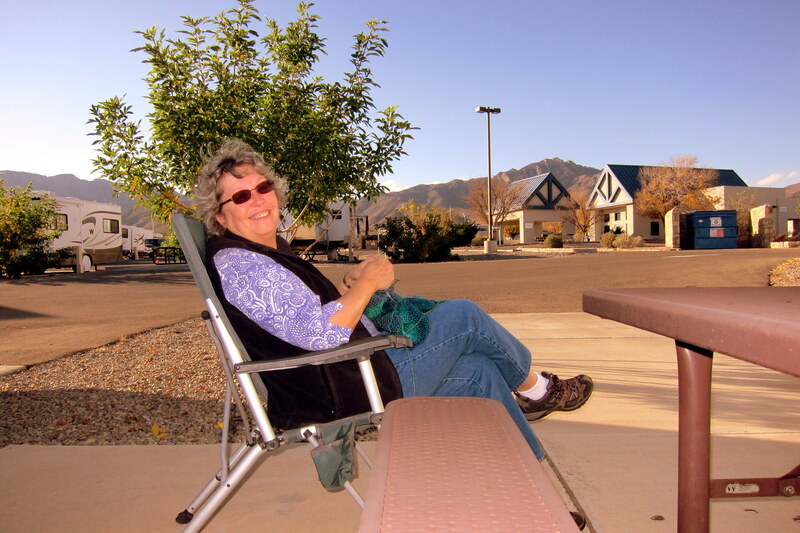 It is however a great place to layover and take care of the chores of RV life such as laundry, shopping, washing the rig, cleaning our 176 square feet of living space, working on the journal, taking care of correspondence, and lots of relaxing. Oh, and the community center you see in the background features a large screen TV, high speed internet and, most importantly, plenty of comfortable leather couches and recliners. Tuesday, December 16, 2014: woke early to the wind whistling outside and our little camper shaking about. Last night, I had reconnected the truck to the trailer in anticipation of an early departure…..in doing so the wheel chocks were loosened a bit and this morning I found them a fair distance from our site. As Kit and I debated traveling in this wind, the sun peaked over the horizon and the wind velocity abated. We figured it was safe…..so following a quick breakfast we were on the road by 0830. 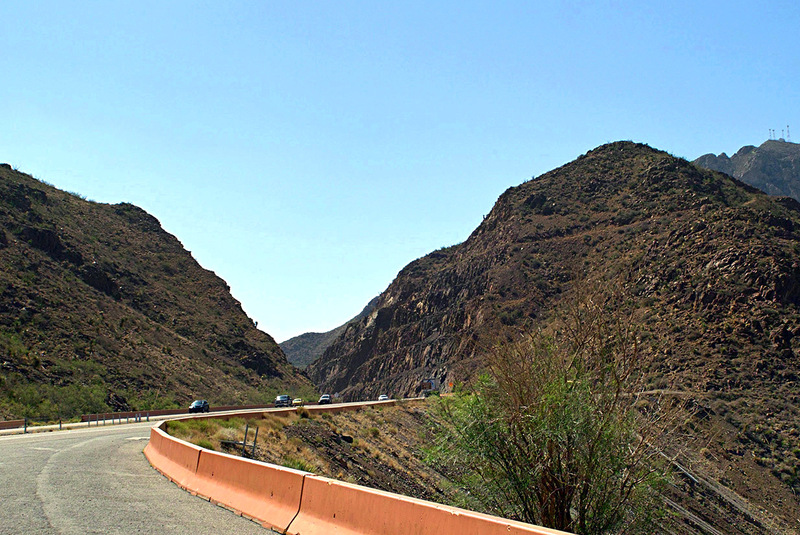 I chose to drive the Trans Mountain Road up and over Franklin Mountain which bypasses El Paso, thereby, creating a shortcut to Las Cruces, New Mexico. This route, in addition to saving time, also allowed me to test the various towing features of our new truck in mountainous terrain. 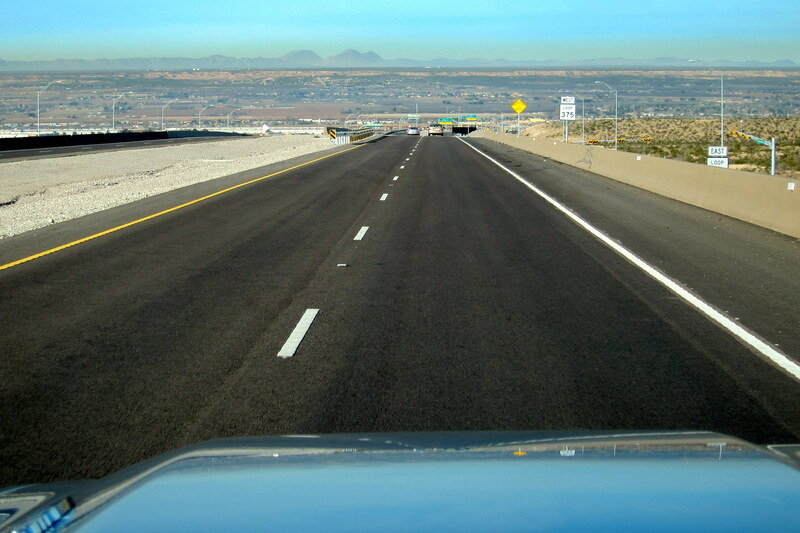 Setting the cruise control at 50 MPH and turning the Exhaust Brake on, I left my foot off the accelerator and brake as the trucks speed control management system took over. The speed stayed within a 2 MPH band the entire transit…..a feat that would have been impossible with my previous truck! 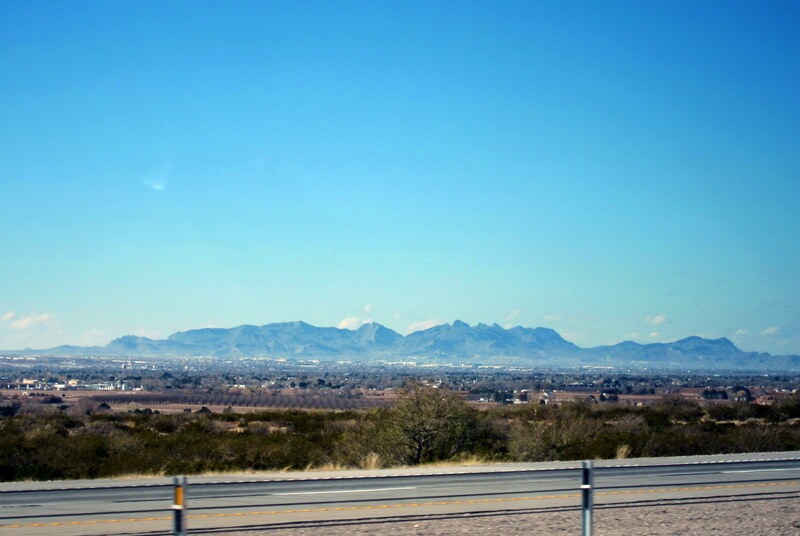 Soon we spotted the town of Las Cruces where we rejoined our old friend Interstate 10. By 0900 Kit and I were crossing into New Mexico. A few hours later we encountered our first Border Patrol Checkpoint and, following a few cursory questions, were waved on through. Oh, and for the record, I don’t think our government officials should curse when asking the public questions! 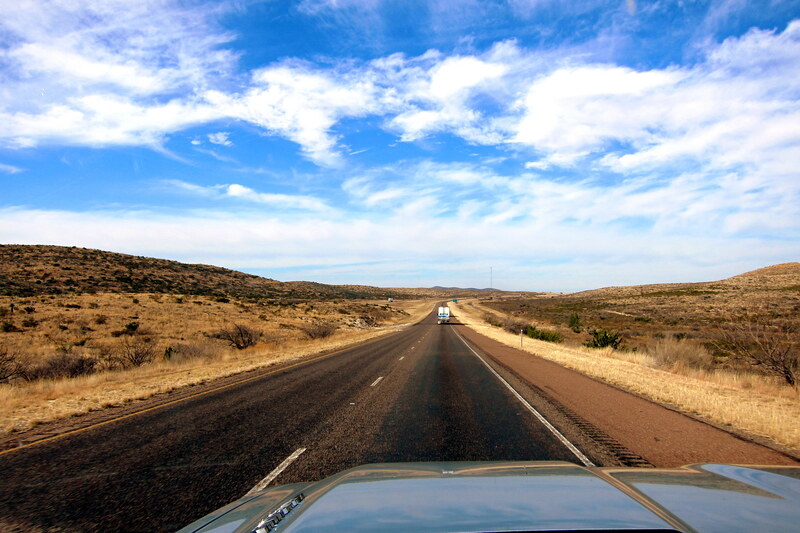 And, in case you’re wondering…..Eastern New Mexico is just as desolate as West Texas, go figure! 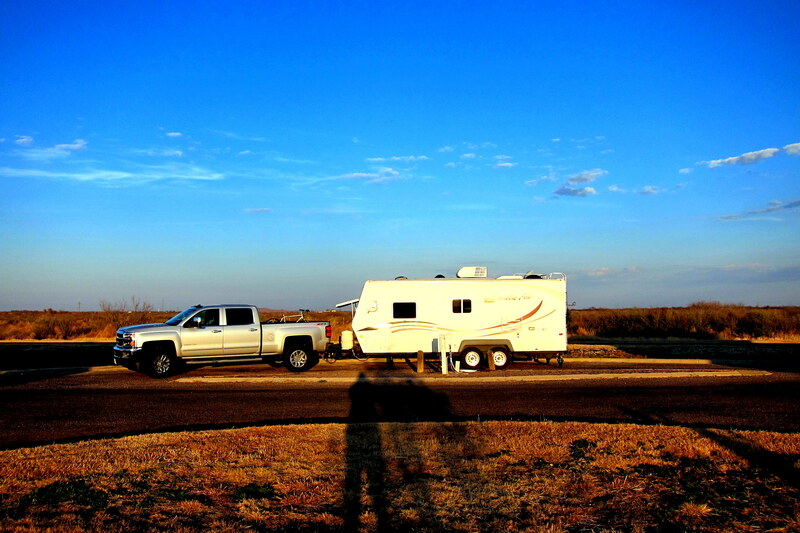 Both of these couples travel about in smaller RV’s, which we currently do as well…..however that is about to change! As Kit and I neared the Dragoon Mountains just east of the Tucson Valley we are getting excited to reunite with my bruzzin Dewey, his blushing bride Bea and our mutual brother, Dan. Most folks now know the bizarre genealogy of my Tucson family. However if you are still confused you’re not alone…..there are days I even have a tough time keeping it all straight! 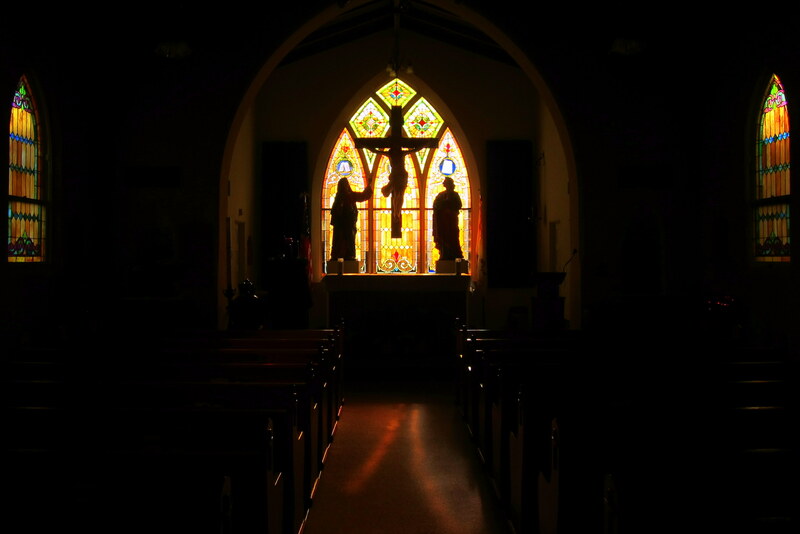 As Kit and I neared the outskirts of Tucson, we pulled off the Interstate toward Vail, Arizona in order to locate a church that my mother had frequently mentioned as one of her all-time favorites. She and her last husband, Dean would drive the 35 miles on Sundays to attend mass with the locals at this chapel. 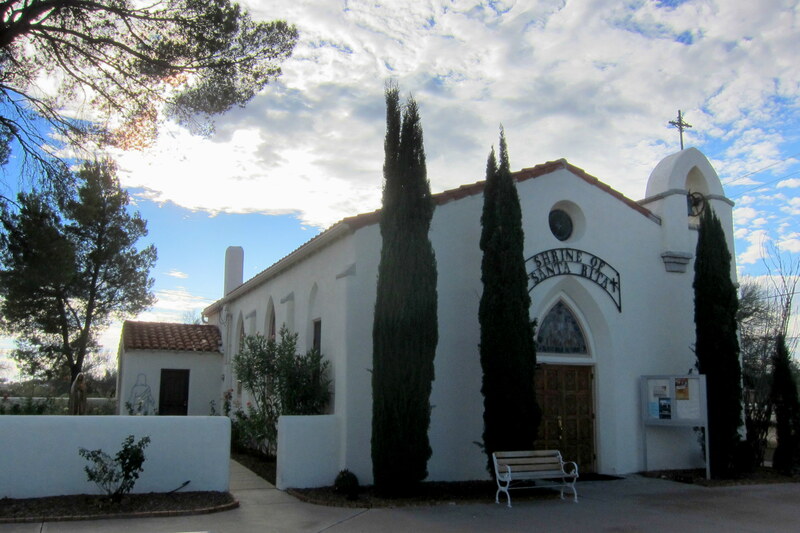 Saint Rita’s of the Desert is a small parish primarily made up of folks of Mexican or Indian descent. The quaint interior is tranquil and with the setting sun piercing the stained glass windows, also very beautiful. 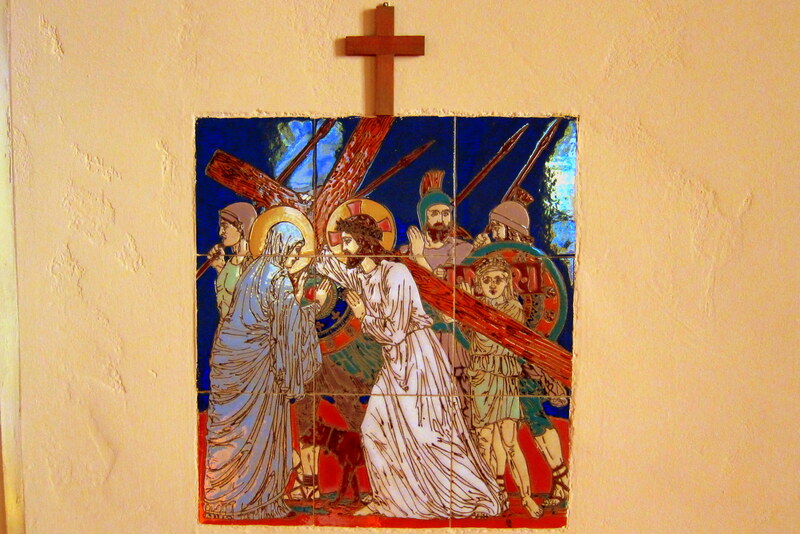 The church is primarily constructed of wood and adobe, and the Stations of the Cross that line the walls are rendered in Mexican Tile. Kit and I spent a few minutes in the quiet church feeling content, at peace and close to mom…..it is no wonder that she and Dean truly loved this church. 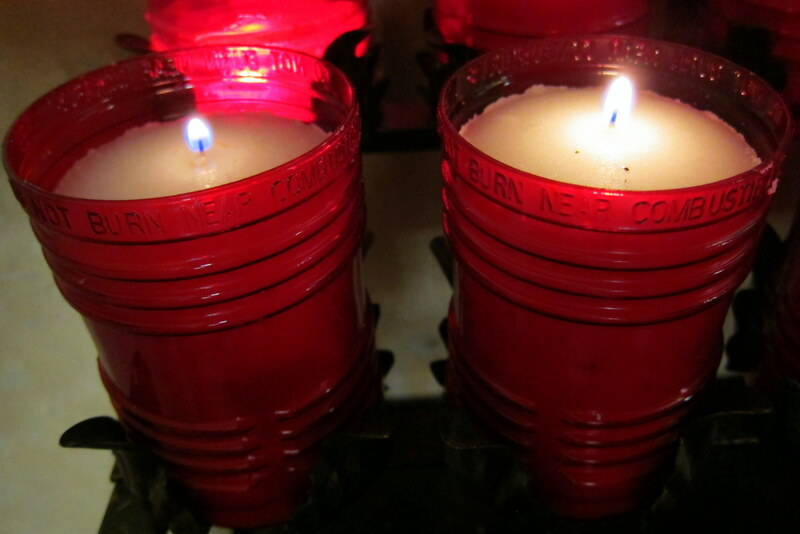 Before leaving, we lit two Votive Candles in their memory and watched as the smoke carried our prayers heavenward. Within the hour Kit and I were back on I-10…..and 45 minutes later we were pulling into Dewey and Bea’s ample driveway and our camp spot for the next couple of days. 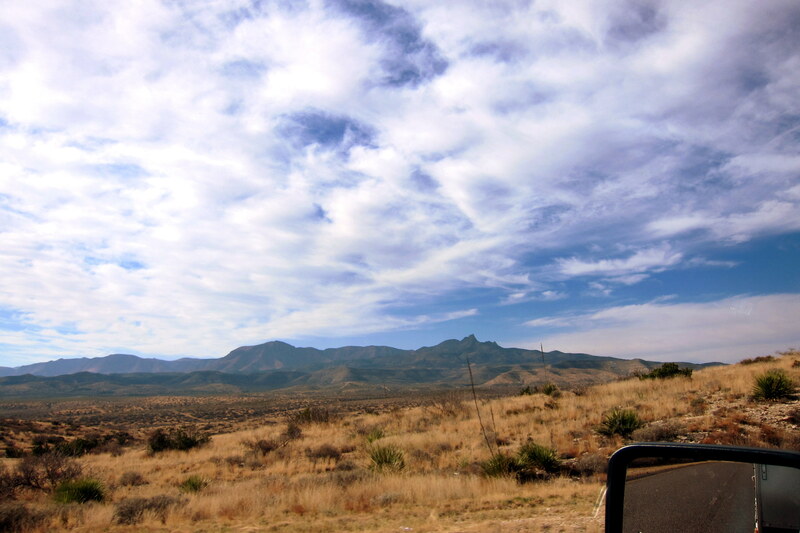 Kit’s Bit’s: Our latest trek from Texas to Arizona was relaxing and uneventful. I love stopping at Balmorhea State Park, it’s so peaceful there. 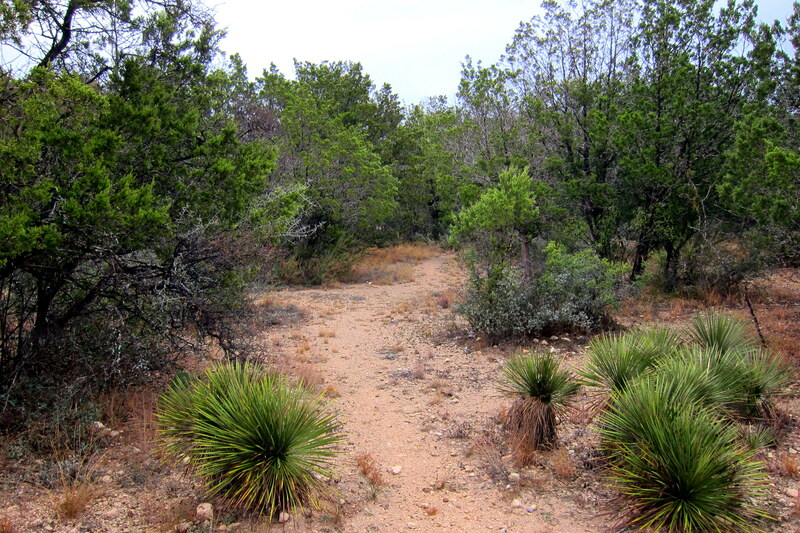 Also enjoyed South Llano State Park but it was so isolated that we had no internet access which makes me nuts. The weather was “iffy”; Bill only likes warm sunny days, so we moved on. For the record, I actually enjoy cloudy, even rainy days. Gives me a chance to catch up on things, sometimes even take a nap! I READ SOME WHERE, THAT ALBERT EINSTEIN DID THE CALCULATIONS FOR THE SAN SALOMON SPRINGS GALLONAGE. WHAT KIND OF FISH ARE STOCKED AT SAN SALOMON??? DID YOU HAVE A COMPARISON ON FUEL CONSUMPTION GOING UP THE MOUNTAIN WITH THE OLD GMC?? DOES THE CRUISE CONTROL REALLY CONSERVE FUEL. MY DODGE RAM 5.7 HEMI SEEMS TO BE SHIFTING FREQUENTLY WHEN GOING UP GRADES. HAPPY NEW YEAR AND DRIVE SAFE. Hi, sorry this reply is so late…..been some busy! However thanks for the comment…..its always great to hear form you folks. I do have complete fuel economy records form the 2008 GMC while towing and am in the process of collecting the same for this new truck. of course trying to keep all conditions, speed, wind, terrain, etc. consistent is next to impossible, but I should get pretty close. The 2015 Chevy handles mountains, both ascending and descending, much better…..part of that is the diesel and part is the Allison transmission. Take care! Well, one gem you missed in El Paso….they have a Savers (or at least they did the last time we were there). Hi, Dewey and Bea! And hi to you too, Pat and Sterlin! Hi, sorry this reply is so late…..been some busy! We did miss Savers!?!? Will have to check it out “if” we ever decided to venture into town that is! Dewey and Bea send their regards to you folks as well. When your comment came into my iPhone we had just sat down with Margaritas…..after reading your note, the topic change to you guys. Did you feel your ears burning? Take care of each other and enjoy the warmth of Florida. Chuck and I are still in our 26 foot Artic Fox RV. 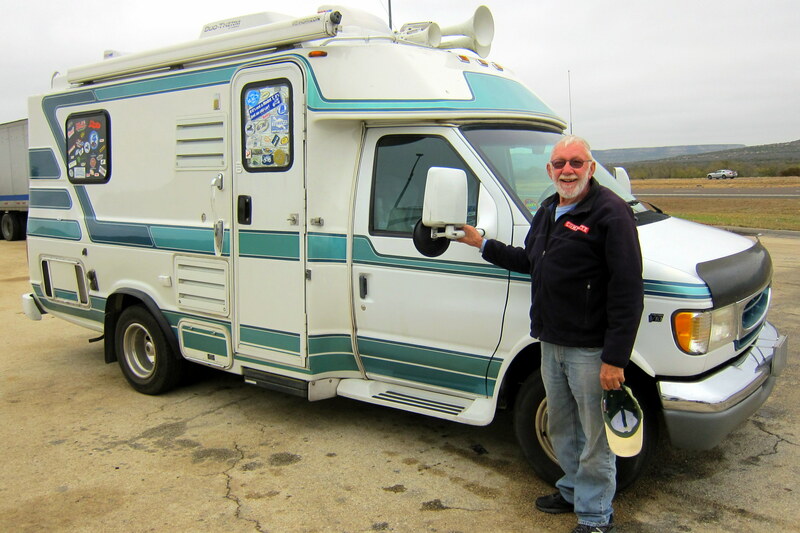 The RV stays permanently in Rockport Texas. 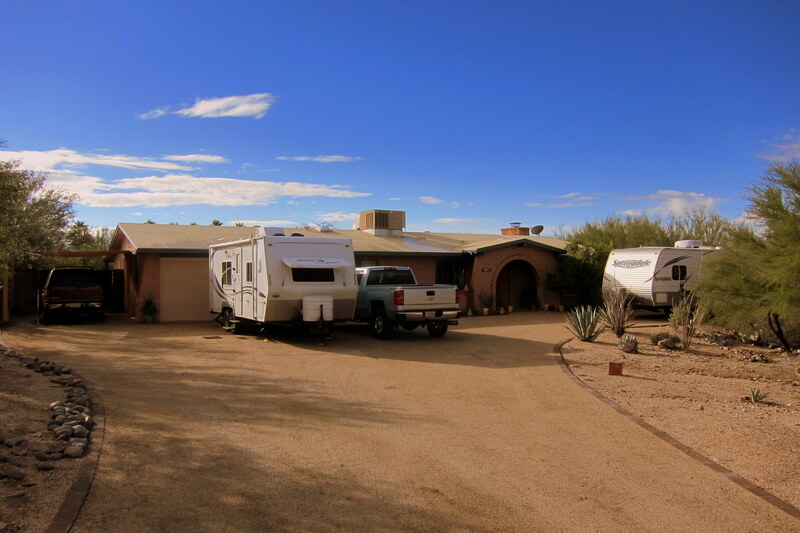 We have purchased a lot that we may someday build on, but in the meantime it is the location where we live in our RV. We are a 3 block walk to the Gulf. Chuck has taken photography classes at the local art center and I have taken metal smithing and jewelry classes. It is a small, coastal, fishing village and suits us well. We are about 45 minutes from Corpus Christi and about 3 hours from San Antonio. We are enjoying following your blog. Hi folks, great to hear form you and sorry this reply is so late…..we’ve been some busy! Kit and I know the area you are camping well, her sister used to live near San Antonio, and we have stayed at the Corpus Christi Naval Air Station a time or two. Next time we are in the area, we’ll give you a shout….it would be fun meeting for a meal somewhere and getting caught up. Take care, and enjoy your new Texas home! Better get your eyes checked. I saw one more dove or at least part of a dove in your pic. How long did it take you to get them to pose or are they stuffed? Nice journal. Thanks, Bro! I noticed the deer and birds but didn’t see the bunny until I had snapped off a few shots! Amazing camouflage Mother Nature uses!! Hi folks, great to hear from you as always. Sorry this reply is so late…..we’ve been some busy! It was nice to hear from LeaRae and Chuck as well…..would be nice if the six of us could meet up at some point, somewhere. We are on the left coast and stayed north of Yuma on the trip over from Las Vegas. If we get anywhere near you folks, rest assured we will stop in for a visit! Take care and thanks for leaving the comment on our website! Hi, Bill’n’Kit – – Miss Polly and I have a map of the US from the 1860s, which shows El Paso as Franklin, and Juarez as El Paso. Thanks for the ongoing saga. Happy New Year. Hi folks, great to hear from you and thanks for the kind comment left on our website. Sorry this reply is so late…..we’ve been some busy, but hope you enjoyed a nice Christmas and the happiest of New Years! Take care of each other, and please tell our Sage friends we are well and miss getting together with everyone!